One of the reasons I was asked to start a beauty blog was to talk about things like ingredients and skincare in general, so I’ll be doing a number of posts on these topics. To make it easy to search these topics, they will all be titled Skincare Basics (I will also be doing the same for Hair Care). 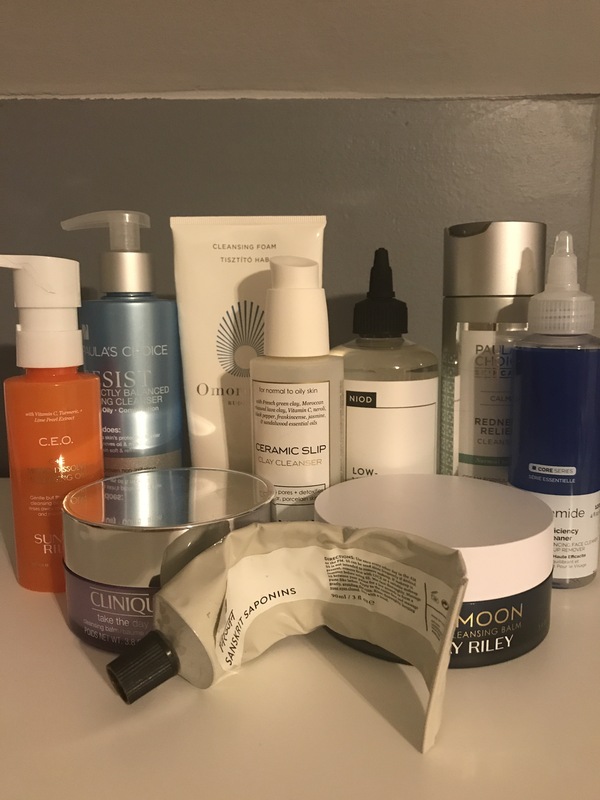 Cleansing is the foundation of any skincare routine, so I thought it would be the best place to start. There are many schools of thought on cleansing. My mother, for example, uses nothing but water on her face, and has been doing this for over 40 years. I do not advise water-only cleansing (I also really wish I had a good quality pic of my mom’s skin at my age to use as a comparison, because I’m pretty confident my skin looks better- yay chemicals!). Some people swear by water rinse only in the morning with full cleanse at night. The logic behind it sounds lovely- all you did was go to sleep after you cleansed, why risk over-cleansing? But if you’re like me, nighttime is when you use the big guns in your skincare arsenal. This is when the retinols and alpha hydroxy acids come out. Do you really want to leave that on your face the following day? For a while, one of my sisters used the Oil Cleanse Method (further information can be found here). This method involves using a customized blend of oils (usually 2 or 3) based on skin type/concerns. From what I’ve seen and read, strict oil cleansing is a love or hate thing. My sister loved the results but hated the amount of time involved. I tested it briefly and was thoroughly unimpressed. However, my experiment with this did give me an appreciation for oils in skincare, which surprised me (I have combo-oily skin, so the idea of intentionally adding oil to my skin was foreign). One of the biggest discussions I see on skincare is the question of double cleansing. The idea is to do a two-step cleanse at night, first removing makeup/sunscreen and then cleansing the skin. Caroline Hirons has written extensively about this; I highly recommend her cheat sheet on cleansing. That said, I am going to admit that I do not frequently double cleanse. Not because I don’t believe it’s a good idea (I think it is), or because I don’t need to (while I don’t wear makeup, I do wear SPF everyday). My issue right now is finding the right combination of products- I suspect I need more gentle products for both steps. The current cleanser stash is a bit out of control. Let’s just say that there are things I use because I really like them and things I use because I’d really like to get rid of them! Rather than doing separate blog post reviews, I’m just going to mention a few of the favorites in my current stash, with a brief explanation of each. I feel it’s important to mention here that I have expensive taste in skincare. Skincare does not need to be expensive, and in all honesty, cleanser is the first place I would suggest you can cut corners. While I have some strong reservations about Beautypedia reviews, their list of Best Cleansers is a really good starting point, particularly for more budget-friendly suggestions. NIOD Low Viscosity Cleaning Ester- this seems to be a love/hate product, and could possibly be deserving of its own post. It does remove makeup well, though not as well as TTDO. This is one of the products that I will use at night as my only cleanse. It smells awful- it took me forever to get used to it. It also leaves what feels like a film after you rinse, which is why so many people hate it. But the thing is, if you give it a few minutes, what starts out feeling like a weird film ends up feeling like amazingly soft skin. The feeling is very similar to my experience with oil cleanse method, minus the onslaught of breakouts. Sunday Riley CEO C+E Micro-Dissolve Cleansing Oil- this is hands down the best cleansing oil I’ve tried, purely in terms of aesthetics. It emulsified and rinses much cleaner than I expected. Not a fan of the citrus peel oil in the ingredient list, as this is a potential irritant, but it continues to be a bit of a guilty pleasure while I search for another cleansing oil that makes my skin feel this good. A quick word about Clarisonic and other cleansing devices: I absolutely loved my Clarisonic when I first got it. As I moved more towards chemical exfoliants, I found Clarisonic to be overkill, even using the softest bristles. I think that it really comes down to paying attention to what your skin can tolerate. Skincare should not be painful. Ever.